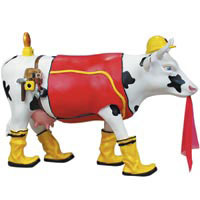 CowParade Retired Udder Cowstruction Construction Cow Figurine | CowParade New Figurines | One Price Low Flat Shipping! 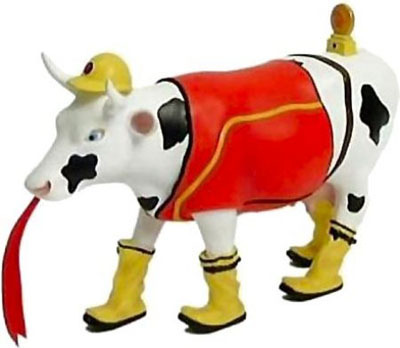 From the Westland Giftware Cow Parade Collection, Udder Cowstruction. Designed by artist, K8 creations. Featured at Cow Parade Houston 2001 exhibit. Made of hand-painted resin. Measures 4" x 6"
This hilarious holstein is dressed like a construction worker, complete with hard hat, boots, and a red flag in its mouth!